How popular can the Raspberry Pi get? It's the Little Computer That Could, a little wonder that's showing schoolkids that there's more to computing than toiling in the Excel Mines - and by the time you read this it's likely to have sold more than 2.3 million units. That's way ahead of schedule - the Raspberry Pi foundation is planning to hit two million units by spring 2014 - and way beyond the project's initial hopes of selling 1,000 units. By the end of 2014, even 2.3 million may seem like an awfully small number. The Pi is a wonderful machine, but even its biggest fans admit that on its own it isn't the most user-friendly device around: it's not something you just pick up like a Hudl or HTC One. That makes the sales figures so far even more impressive, and it suggests that there's an opportunity to grow sales much further by making the Pi a little friendlier. That's exactly what's happening. From December, Raspberry Pis started appearing on the shelves of US electronics giant Radio Shack in the form of a starter kit featuring everything you need to get up and running. As Eben Upton, co-founder of the Raspberry Pi project, explained: "If we're going to reach our goal of teaching a whole new generation of children coding and making skills, it's important that Pi should be easily available… having it in retail alongside a great kit and documentation is part of that." Radio Shack isn't the only place with its fingers on the Pi. The enormous UK electronics distributor CPC has its own starter kit, the Deluxe Starter Kit, which comes in fun packaging and brings a keyboard, mouse, components for a DIY traffic light kit and a bear called Babbage to the Pi party. It's fun, friendly, and at £83 plus VAT it's eminently affordable too. Older tech fans will have fond memories of the BBC Model B, the computer that persuaded many parents to get their kids coding. If you're one of those kids you'll get some serious nostalgia when you see the Fuze, a Pi-based computer kit that's designed specifically for education and which comes backed with lots of useful resources and demos. At £179 it might sound pricey compared to the Pi on its own, but you get the Pi plus a lot of goodies for significantly less than many people spend on small tablets - tablets that we're pretty sure won't give children the sense of achievement and excitement they'll get from making their own computer and learning to code on it. We're pretty certain nobody's modified an iPad mini to translate dogs' thoughts into human speech. Achievement and excitement are what the Pi is all about. Speaking after the Raspberry Pi Foundation was named Social Impact Business of the year, head of communications Liz Upton said: "We believe computers are a tool for creation, not consumption." She wasn't referring to the creation/consumption argument that's dogged tablets, but the wider issue of what children should be learning at school: many people think it'd be better for children to learn programming than PowerPoint. Games Workshop co-founder Ian Livingstone expressed it beautifully in a Guardian debate last month: "It's like someone being able to play the video game Angry Birds, but having no idea how to make Angry Birds… teaching kids how to read, but not how to write." In England, the ICT curriculum is being switched off and back on again in 2014 - and that's something the Raspberry Pi Foundation is excited about. 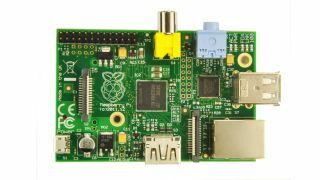 "We're looking forward to the coming year's curriculum changes, to seeing more and more young people producing more and more projects with the Raspberry Pi, and to introducing more free educational content for the Raspberry Pi aimed at pupils and teachers in 2014," Upton said. The foundation has been putting its money where its mouth is: to mark Computer Science Week in early December, it gave away 2,000 Raspberry Pi units to UK students. The only condition was that the students came up with an idea for a cool Pi project. One person who's convinced of the Pi's potential is a certain Stephen Wozniak, whose previous adventures in DIY computing worked out quite well. Woz recently invested in the Kickstarter for Kano, a colourful and extremely friendly Pi kit that raised a whopping $1.35 million from nearly 12,000 backers who should get their kits by the summer. Kano's pitch is wonderful. "This is Kano," it says. "It's a computer - and you make it yourself." It makes computing sound as simple as Lego, and that's the whole idea: for $119 ($99 for initial backers) you're getting something as simple as Lego but with the enormous possibilities of the Pi. It's "a computer kit for the rest of us" Kano says, echoing the slogan for Apple's 1980s Macintosh. You know that echo isn't an accident. Kano also demonstrates what makes the Pi different. It's a computer, but it isn't just a computer: making a computer is the beginning of the adventure, not the end of it. Kano promises a robotics kit by next Thanksgiving (November, for those of us who don't live in the US), and of course the Pi has already spawned a great ecosystem of add-ons ranging from displays to DAC converters that enable a Pi to deliver multi-room streaming music. It might even produce the next DeadMaus. To use a thoroughly non-tech and utterly unscientific metaphor, it does rather seem as if the Pi's planets are aligning: the computing curriculum's being given a much-needed reboot that puts programming back where it belongs, the ecosystem's growing and some very smart people are bringing first class product design and marketing to the party. It looks like the Pi is just warming up.